If you have read Brian Harry post Visual Studio Online Update – Sept 4th you may have noticed that with last week’s update (sprint 70) it is now possible to integrate Visual Studio Online with Hubot. Although that is not 100% correct, it was already possible before, the fact is currently there is not too much information how to do it. it is my intention with this post (the first from a series of three posts) to try to disseminate some information how to integrate Visual Studio Online with Hubot. In this post I will try to show you, how can you perform Visual Studio Online tasks with an almost vanilla Hubot installation, on a second another post I will show you how to configure Hubot to use Visual Studio Online Team Rooms and finally on a third post, how you can run your Hubot installation from an Azure Web Site. 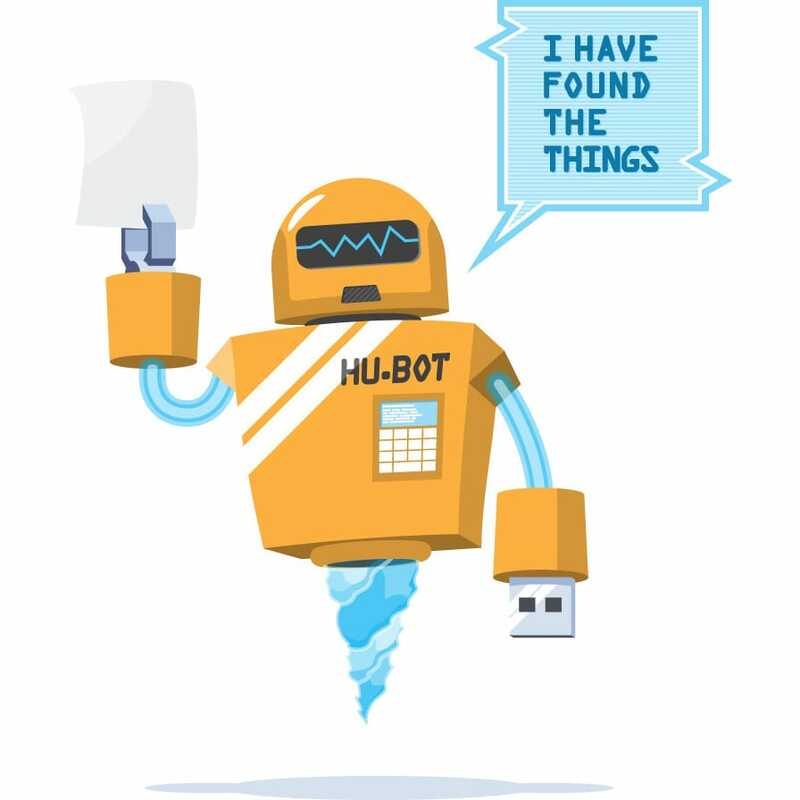 Hubot has been developed by GitHub and it is a robot (or company’s robot has they put it) that allows automation of tasks from your chat room. Scripts – Scripts are responsible to implement integration with other systems, to automate tasks. A script is a group of commands that implement that automation. You can add more scripts to automate tasks from other systems. There is a bunch of scripts kept by GitHub, but you can found a lot of scripts on the internet. Adapters – Out of the box, Hubot only supports Campfire as a chat room. But you can make it work it other systems, by installing another adapter. An adapter is responsible to implement the communication between Hubot and your chat room (in fact it doesn’t need to be a task room it can be IM systems like GTalk or any IM client which implements XMPP). GitHub maintains the “full” list of third party adapters and I’m sure others that are not on this list can be found on the internet. Adapters and scripts are decoupled. The scripts just integrate with the external system, you can use any adapter you want and the scripts will just work. Flunky would be a much better name for Hubot. He is allways ready to take orders from people issuing commands in chat rooms. Out of the box Hubot can do important stuff like show you Pug pictures, mustachify images, translate phrases and a lot of other stuff, but you can install a bunch of optional scripts to do even more stuff. By now, you must have guessed that in order to integrate Hubot with Visual Studio Online we are going to use a script. The script can be executed in two different modes. Trusted Mode – In trusted mode, all commands executed on Visual Studio Online (on behalf of the users) will be done with the Hubot user credentials. This mode is simpler to configure, but it has three disadvantages. Impersonation Mode – On this mode all commands will be executed as if the user has executed it himself. But don’t worry Hubot doesn’t know the user credentials and before any command is executed as the user, the user will have to authorize hubot to execute comannds on behalf of the user (the user will only need to authorize this once and can ask Hubot to forget about him anytime). As you probably guessed by now, impersonation mode uses OAuth. Although this mode takes a little longer to configure (10 more minutes ) it has advantages. The operations will be logged with the name of the user who issues the command, so operations will be auditable and more traceable (eg: if you see work item changes, they appear as performed by the user who issued the command). If you intend to use impersonation mode, then you can skip this step. If you intend to use trusted mode, then you should skip this section. t least the mandatory fields. Later on you will need some of the values (App Id and App Secret) provided on this screen. The simplest way to run, Hubot is to install it on Un*x machine, it took me less than 10 minutes to configure Hubot on a Ubuntu Linux instance running as an Azure Virtual machine. To make things simpler, I have configured it to run on Campfire (since it’s supported by default), but you could configure an adapter to work with other popular group chat systems like Flowdock or HipChat (I will explain how to integrate with Visual Studio Team Rooms on another post). This may sound complicates, but you only need to edit the external-scripts.json and make sure it contains the Visual Studio Online hubot scripts referenced. The file contains one array with the module name(s) of the external scripts. Since I only have one external script, I just add one element to the array with the name NPM hubot vso script module. If you see these parameters, the script will run in trusted mode. Remember you will need to configure SSL if you are using impersonation mode. If you haven’t done it yet, now you should configure campfire adapter. We are now ready to enter a campfire chat room, and start issuing commands to hubot. You can notice, in this room called “hubot” (how original), right under the “Who’s here?” there are two persons. Me and Hubot. Hubot vso room default <key> = <value> – Sets a room default project, etc. Hubot says it doesn’t know me yet, and requires me to authorize him to do operations on my behalf,. It’s nice enough to give me a link so I can authorize him. Clicking on the link will lead us to an authorization page (you don’t need to issue this command in particular, any command that requires interaction with Visual Studio Online will trigger (for the first time) the authorization request). with your name (your display name) and your email. We are now ready to issue commands against Visual Studio Online. repositories – the list of Git repositories (separated by commas). noticed hubot created a work item, replied with the work item id and a link to the work item. It shows the top 5 hits from MSDN forums and if you want the full list of results there is also a link to it. I have not described all the available commands (remember you can issue at any time hubot help vso to get the full list of Visual Studio Online commands). I hope I have successfully shown you, how to configure Hubot to issue commands against Visual Studio Online and some of its potential. On my next post, I will explain how you can configure Hubot to use Visual Studio Team rooms instead of Campire and on the third post of this series will show you, how you can configure Hubot to run on an Azure Web Site. I recommend you create youtube video for this process. Have you tried setting it up on a unix VM or a Windows azure web site?